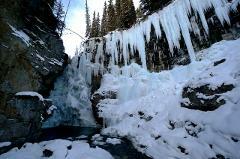 Trek through Johnston Canyon to a world of frozen waterfalls and pillars of blue ice. This interpretive guided walk along the canyon bottom and over suspended catwalks and leads you past waterfalls frozen in mid-stream. 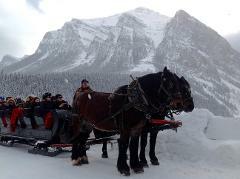 Enjoy a tour to Lake Louise with ample time to partake in some truly Canadian winter experiences. Walk along the frozen lakeshore, join your guide for a bit of snowshoeing, rent some ice skates or take a horse drawn carriage ride! Led by professional interpretive guides, a journey of discovery awaits you in pristine snow covered forests and along the banks of frozen rivers. Track wildlife, learn about winter ecology and have a snowy good time! Snowshoe at world famous Sunshine Village Ski Resort—where the gondola and a chairlift ride takes you straight to the land above the treeline(7,150 ft). 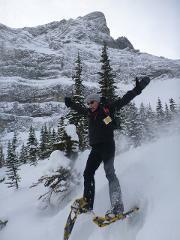 Put your snowshoes on, walk away from the ski area and snowshoe into a powder paradise!